2Doç. Dr., İzmir Bozyaka Eğitim Araştırma Hastanesi, Göz Hastalıkları, İzmir, Türkiye Purpose: To investigate the short term effects of selective laser trabeculoplasty (SLT) on the intraocular pressure (IOP), central corneal thickness (CCT) and corneal endothelial cell analysis. 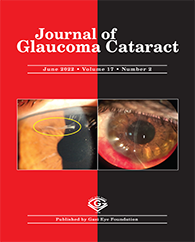 Materials and Methods: Thirty eyes of 30 primary open angle glaucoma (OAG) patients were included in this study. SLT was performed on all patients at 360 degrees of trabecular meshwork. Corneal endothelial cell analysis, CCT and IOP measurements were performed at baseline before SLT as well as 1 week and 1 month after SLT. Results: Thirteen of 30 patients were male (43.3%) and 17 were female (56.7%). The mean age of the patients was 70.03 ± 8.4 years. Although IOP increased at the fi rst hour following SLT, a statistically signifi cant decrease occurred during follow-up (p<0.05). No signifi cant difference was found in corneal endothelial cell analysis after SLT when compared with baseline measurements (p>0.05). Although a slight increase in CCT was observed during follow-up, the difference between pre-and post- SLT values was not statistically signifi cant (p>0.05).